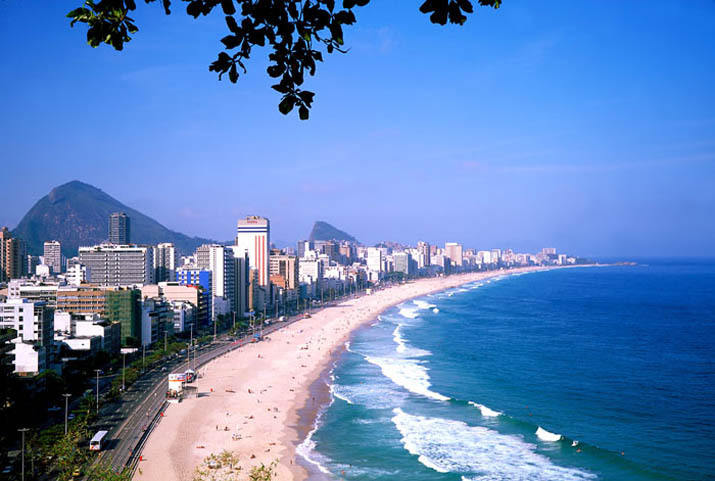 Rio de Janeiro lies on a strip of Brazil’s Atlantic coast, close to the Tropic of Capricorn, where the shoreline is oriented east–west. The city largely faces south. 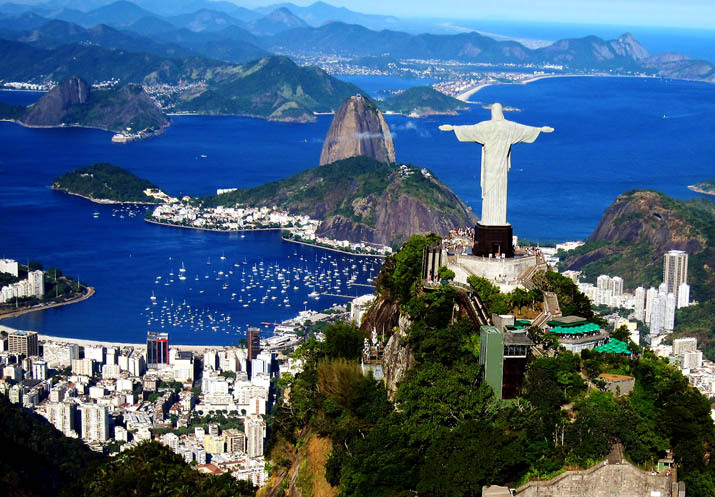 It was founded on an inlet of this stretch of the coast, Guanabara Bay (Baía de Guanabara), the entrance to which is marked by a point of land called Sugar Loaf (Pão de Açúcar), a “calling card” of the city. 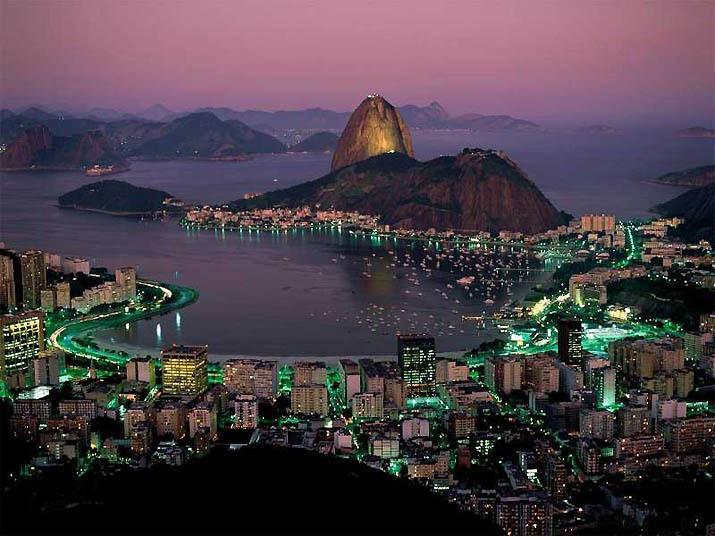 The Centre “Centro,” the core of Rio, lies on the plains of the western shore of Guanabara Bay. The greater portion of the city, commonly referred to as the North Zone “Zona Norte,” extends to the northwest on plains composed of marine and continental sediments and on hills and several rocky mountains. The South Zone “Zona Sul” of the city, reaching the beaches fringing the open sea, is cut off from the Centre and from the North Zone by coastal mountains. These mountains and hills are offshoots of the Serra do Mar to the northwest, an ancient gneiss-granite mountain chain that forms the southern slopes of the Brazilian Highlands. The large West Zone “Zona Oeste,” long cut off by the mountainous terrain, had been made accessible by new roads and tunnels by the end of the 20th century. Rio has a tropical savanna climate (Aw) according to the Köppen climate classification and is often characterized by long periods of rain from December to March. The temperature occasionally reaches over 40°C (104°F) in inland areas of the city, and maximum temperatures above 30°C (86°F) occur on a monthly basis. In the main tourist areas (south side, where the beaches are located), the temperature is moderated by the cool sea-breezes from the Atlantic Ocean. Along the coast, the breeze, blowing alternately onshore and offshore, modifies the temperature. Because of its geographic situation, the city is often reached—especially during autumn and winter—by cold fronts advancing from Antarctica, causing frequent weather changes. It is mostly in summer that strong showers provoke catastrophic floods and landslides. The mountainous areas register greater rainfall since they constitute a barrier to the humid wind that comes from the Atlantic. The average annual minimum temperature is 20°C (68°F), the average annual maximum temperature is 26°C (79°F), and the average annual temperature is 23°C (73.5°F). The average yearly precipitation is 1,086 mm. The minimum temperature recorded was 4.8°C (40°F) in July 1928; temperatures below 10°C (50°F) are very rare in the city. The absolute maximum reached 43.2°C (110°F) in January 1984.The temperature varies according to elevation, distance from the coast, and type of vegetation. Winter brings mild temperatures and less rain than the summer.